Advantages: Excellent color profiles and photographs and English text. Conclusion: A book for a niche audience that will be rewarded. The late 1920s and early 1930s was a period of transition for the Polish Air Force. Foreign built aircraft, particularly the French SPAD, had reached the end of their effective usefulness, not only as a combat aircraft, but also as a trainer. The aviation industry in Poland was beginning to grow. There emerged a new generation of domestically produced fighters and trainers. With the growth of Polish aviation there was a clear need for the training of more pilots. While Poland had a reasonably good basic trainer in the RWD 8, it could be seen that more advanced trainers were needed. 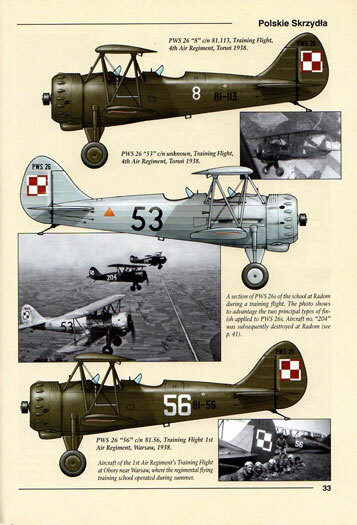 One aircraft company, Podlaska Wytwornia Samolowtow (PWS; Podlasie Aircraft Factory) sought to meet this need with the introduction of the PWS 12, which finally entered Polish Air Force service, after some modification, as the PWS 14. 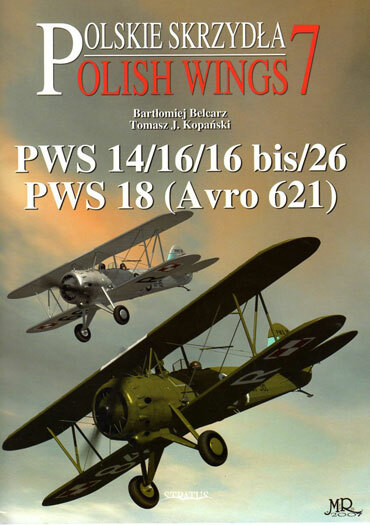 This newest in the Polish Wings series of monographs traces the development and use of the PWS series of trainers, from the PWS 14 through the PWS 26. Each successive model of the aircraft was intended to bring pilot training to a higher level. The PWS 16bis was to provide for better gunnery training and the final version, the PWS 26, allowed for training in blind flying. This volume also covers a few survivors of the invasion of Poland that wound up in foreign hands. Some reached other countries as a result of pilots fleeing the defeat at the hands of the Germans, and others the Germans sold as war booty. While the narrative of the PWS trainer development is in well-written English, most of the story is told through numerous and excellent photographs and profiles. As in the prior monographs in the Polish Wings series, the profiles are well integrated with photographs of the actual aircraft. The photographs also receive detailed captions. For modelers there is a tie-in with Techmod decals. However, the decals must be purchased separately. Techmod produced a sheet of 1/72 decals (No. 72138A) for the PWS-26 that provide markings for 26 aircraft, including Polish, Russian, Romanian and Bulgarian aircraft, based on the photographs in this Polish Wings monograph. A 1/72 model of the PWS-26 is made by RPM Models and is available from Squadron Mail Order, as well as from other retailers. The only downside of this monograph, as far as I am concerned, is the lack of technical data about or line drawings of these aircraft. It would have been nice to see the specs, such as dimensions. This is clearly a monograph for a quite specialized audience. But that audience will be richly rewarded.